Mounting bills can be overwhelming for anyone dealing with debt. 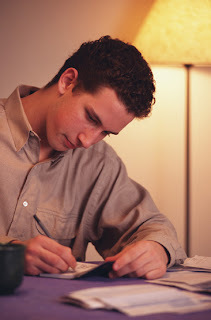 In 2011, consider taking some steps to alleviate your stress and lower your level of debt. Think about using a Home Equity Line of Credit (HELOC) for credit card debt consolidation. With a Home Equity Line of Credit simply write yourself a loan whenever you need it, pay it back and use it again. Battling credit card debt can be frustrating. One way that many homeowners are solving their credit card debt woes is by taking advantage of the equity built up in their home and the low interest rates being offered today. If you take out a home equity line of credit, you can get a very low interest loan that can pay off your credit cards. You can approach your bank about a low interest personal loan to pay off your credit card debt. Consolidate your debt onto a single 0% interest or low interest credit card, then make double payments to ensure you're paying down the principle of your credit card debt. 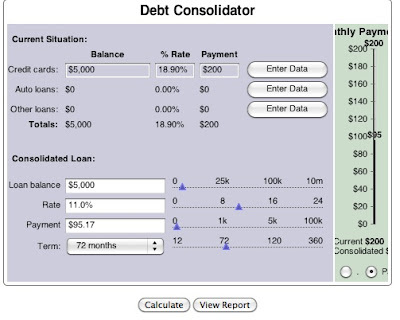 BankofLuxemburg.com has some helpful resources to help you assess your debt, like the Financial Calculation Tools. 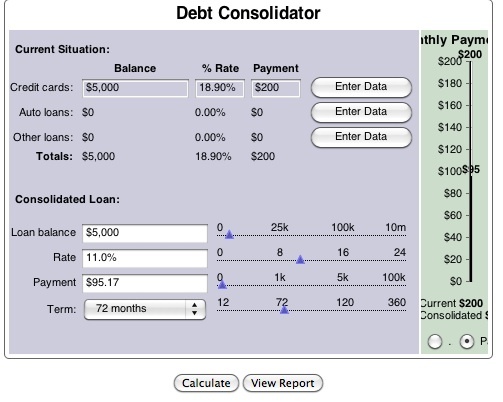 Scroll down and click on "Personal Debt Consolidation" to find the debt consolidator pictured below. Visit bankofluxemburg.com for financial calculators like this one.